This week (October 23-29) is National Massage Therapy Awareness Week,, as sponsored by the American Massage Therapy Association. Their chart (below) lists just some of the benefits of properly applied massage therapy. 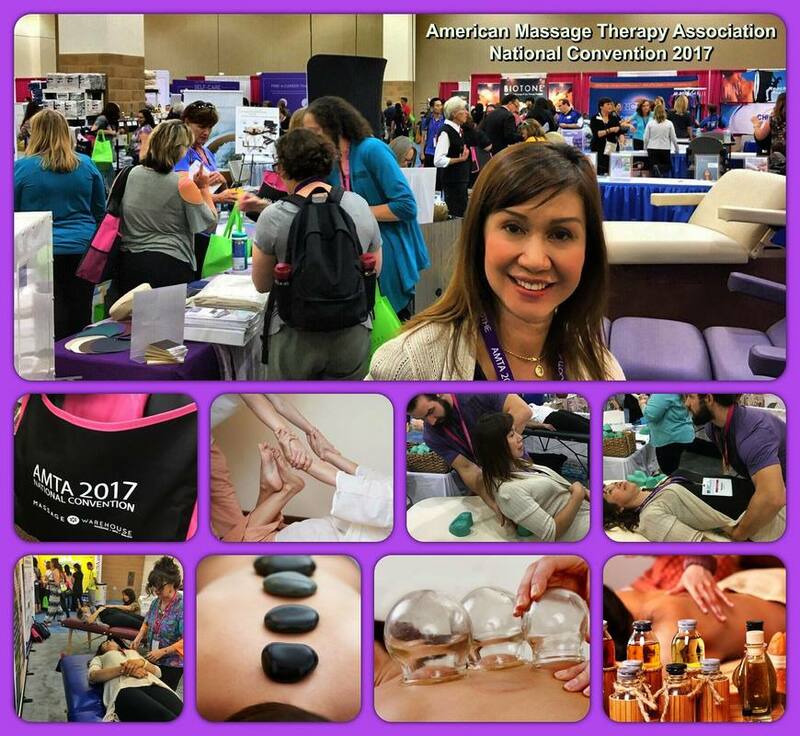 Nina attended the American Massage Therapy Association's National Convention yesterday, where she was able to meet with therapists, practitioners and vendors from throughout the industry. She was also able to test new massage-related health benefit techniques, devices and procedures for our staff, clients and customers. A person with poor circulation can suffer from quick fatigue, lactic acid build-up, the pooling of blood in the extremities and more serious ailments. Good circulation, which massage supplies via the squeezing and pulling movements, brings damaged and tense muscles the oxygen-rich blood they need to heal. Give us a call today to set up your appointment. One of the most acclaimed benefits of therapeutic massage is reducing by your body's overall stress levels. It is by far the most sought-after benefit from our hundreds of clients and customers. Overview Stress occurs when a situation, event or thought becomes threatening, worrisome or anxiety-provoking. A small dose of stress is normal, healthy and helps people achieve goals and meet deadlines. According to the National Institute of Health, chronic stress causes anxiety, depression and heart disease. Massage is an effective form of stress reduction and management--it provides physical and psychological benefits that counter the symptoms of stress. Triggers the Body's Relaxation Response The emergency stress response, or the "flight-or-fight" response, is the body's physical reaction to stress. Stress elevates the heart rate, increases muscular tension, breathing rate and feelings of anxiety. Dr. Herbert Benson, an associate professor at Harvard Medical School, has researched how to elicit the body's relaxation response, the opposite physical reaction of the emergency stress response. Massage promotes the relaxation response--heart rate decelerates, breathing rate slows and muscles relax. Lowers Blood Pressure According to the American Heart Association, research does not directly link high blood pressure with stress. However, AHA states that many behaviors that accompany stress elevate blood pressure: poor eating habits, inactivity, smoking, a high-sodium diet and high alcohol intake. A 2005 study conducted by the University of South Florida found that participants who received 10 massages over the course of three weeks experienced drops in blood pressure. Participants who did not get massages did not see changes in blood pressure. According to a Sept. 4, 2008, Newsweek article titled "Five Surprising Benefits of Massage," massage activates pressure points linked to the vagus nerve. The vagus nerve regulates blood pressure--stimulation helps lower and maintain a healthy blood pressure level. Reduces Muscular Tension According to Help Guide, a mental health nonprofit, Shiatsu massage and Swedish massage promote overall relaxation and encourage muscular relaxation. Headaches, jaw pain, shoulder and neck tension are common symptoms of stress. Massage breaks up lactic acid and other points of discomfort that are symptomatic of stress. What new research shows: A review of more than a dozen massage studies conducted by the Touch Research Institute at the University of Miami School of Medicine concludes that massage therapy relieves depression and anxiety by affecting the body's biochemistry. In a series of studies including about 500 men, women, and children with depression or stress problems, researchers measured the stress hormone cortisol in participants before and immediately after massage and found that the therapy lowered levels by up to 53%. (Cortisol can drive up blood pressure and blood sugar levels and suppress the immune system.) Massage also increased serotonin and dopamine, neurotransmitters that help reduce depression. ​Here's a great refresher on the benefits of massage for women, from the international women's health publication: Health Tips for Women. 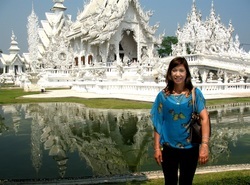 ​After a month-long hiatus visiting friends and family in Thailand, Nina has returned to our Encino spa. Her long-time clients heard about her return date and promptly filled every available time slot for the first two days of her return. 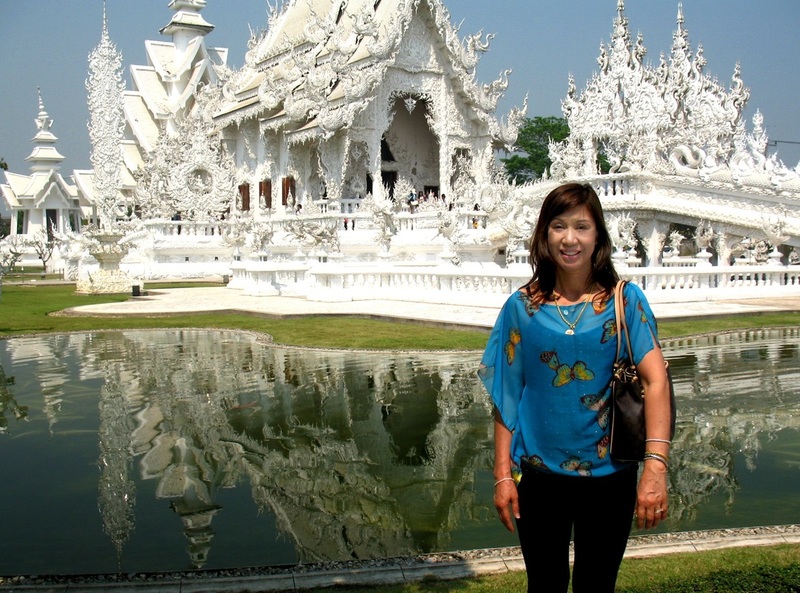 Please give us a call to reserve time with Nina and/or our incredibly-excellent staff of massage master therapists. YES, VALENTINE'S DAY IS TWO WEEKS AWAY. But it's never too early to plan for a special gift for your spouse, loved one, special friend or ??? 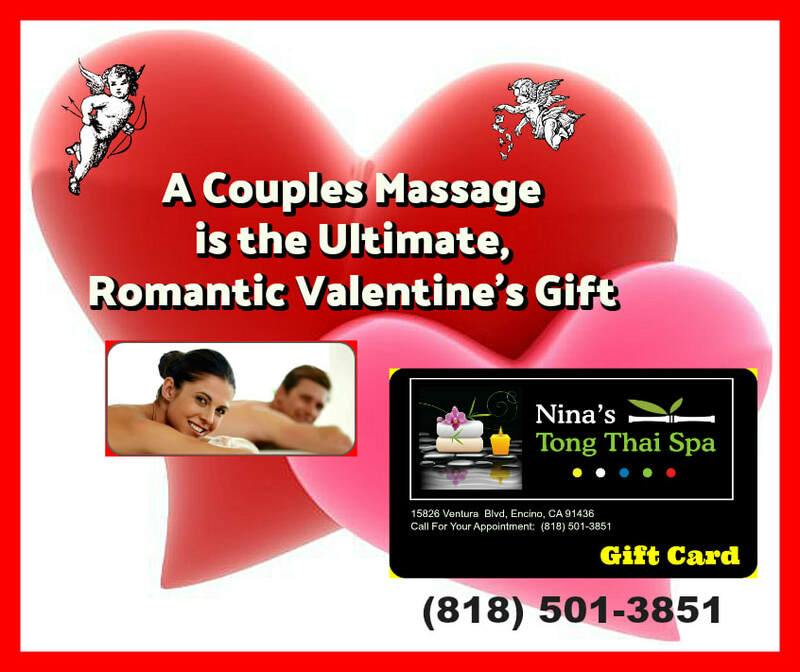 Our Nina's gift cards are truly the gift that keeps on giving, providing an unforgettable experience for the recipient. They are available for any of our massages and for one hour, 90 minutes or two hour time segments. Available now, while supplies last, exclusively at our Encino salon. MASSAGE CAN LOWER YOUR STRESS LEVELS AND YOUR BLOOD PRESSURE: To fully manage high blood pressure, it is important to find time to relax. 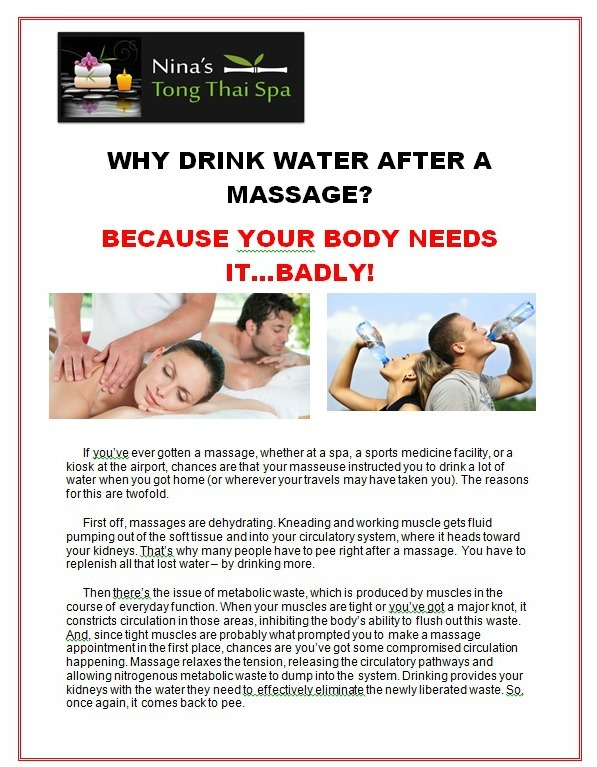 This is where massage can help. Massage can involve many types of hands-on techniques that can be gentle or deep. Getting a massage can lead to feelings of being cared for and taking charge of your health. Massage is relaxing to receive and can lower stress levels. Additionally, massage can help to improve circulation, which may reduce any swelling or edema that occurs as a result of high blood pressure. We are running a special on Facebook, from July 28-August 11. If you just mention that you saw the posting on Facebook, you will be entitled to a $5.00 discount from the price of any of our therapeutic massages. STRESSED AT WORK? Every single scientific study has proven that a therapeutic massage can rid you of stress (and it's ongoing symptoms) fast and effectively. Visit us at lunch time or right after work and feel the stress melt away. If you have never visited us, please make an appointment now. Your mind, your body and your family will be instantly grateful. Call for an appointment: 818-501-3851.